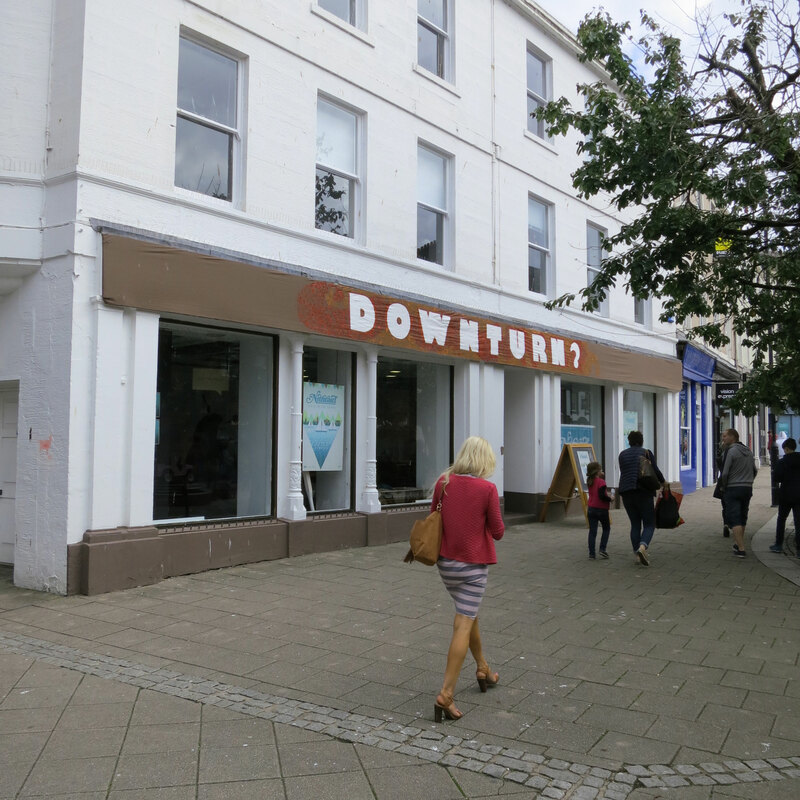 What might a High Street community look like? Who, or what else, lives in the town centre? The usage of the word ‘neighbour’ has been in steady decline since the 1840’s. It’s been Guid Nychburris (Good Neighbours to all of those not originally from or local to Dumfries), this week and the Stove has been exploring ‘neighbourliness’ as part of our current Conversing Buildings project. The building has gone a little Christo inspired, in what is definitely the brightest and boldest we have gone with celebratory decorations so far. The sign board has also had a make over, prompting our latest favourite anagram game. High Street Neighbours is part of our TAKEOVER theme, a series of events and activites focused around community takeover and creativity. Stay tuned to the Stove for more details. what true opportunities are there between the moss and the ‘for sale’ signs? How do we re-make the spaces between the High Streets we remember and what is left when our High Street no longer meets the bottom line of the multinationals? Our town centres have grown out of a need to gather, connect, meet, barter and exchange. Dumfries owes its place to the river, the cattle marts and the passage of people. But from our largely rural context, Dumfries has also been the gathering point, the melting pot of communities meeting and exchanging, not just economically but socially, our connection out into the world. Dumfries is not dead, only sleeping. Hidden Dumfries is in plain sight, behind the sagging bus stances and single occupancy street furniture. This action does not require grand master planners, or large scale redevelopment, but a little collective energy and small positive acts. Testing and experimentation, problem solving and lightweight interventions can lead the way to a more active high street, looking forward to a more valuable town centre. Small actions can highlight, question, explore and initiate discussion, growing from an inquisitive response to our everyday. This is a call for new distractions. Can we create a new visual language for our high streets? Whilst having lunch with my mentor Isabell Buenz and her partner Ewan at the weekend, we got talking about what and who inspired us as artists. I possibly surprised myself a little, so thought it would be worth a share. I’m in an interesting space with exhibition and gallery art having made a very sudden re-appearance in my world, and the otherness, the less definable but certain ‘other’ that represents the work that really excites me. 1. My current research obsession is for Jeanne van Heeswijk. Unfortunatly, I’m yet to meet one of her projects in ‘the flesh’ but I’m sure the time will come yet. First heard of her work through the 2Up2Down project which grew into what is now Homebaked, and was part of the Liverpool Biennial; a project which worked with local people to change and grow their community through a bakery in the Anfield area. The second of her projects I’m particularly excited about is Blue House, which ran from 2005 until about 2009 and was situated in IJburg, an at the time new suburb being in Amsterdam. 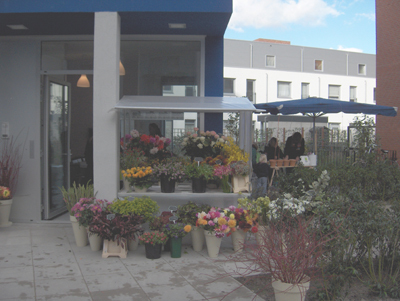 Blue House became ‘a centre for research and artistic and cultural production, looking at what happens when such a radical approach to urban planning and community development is employed,’ and ran all sorts of projects from opening a flower shop, to running pop up cinemas and hosting research residencies. Her website is also a total treasure chest and mine-field in one. 2. Sarah Kenchington’s Wind Pipes for Edinburgh. This was a really fascinating work I came across during the Edinburgh festival. The site was a bit of a hidden treasure (visit here), and the work itself was a beautiful jumble of found parts and the most beautiful bent penny buttons. The films recording this work show the composers performing, but when I visited all were invited to play, the invigilator proudly told me she’d sussed out how to play the Harry Potter theme tune that afternoon, and had the notes if I wanted to give it a shot (I passed). Being able to play with it felt more exciting than watching someone else playing it. This has promoted a fair bit of art-that-isn’t-like-art chat, both over lunch, and at home. I do a lot of talking about social media as an arts practice, youth work or events management as an arts practice. In my view it all comes down to process. In all actuality, what I really am when it comes to it is a process-artist. The outcome, whether it’s an installation, ‘object’, event, or something far less tangible is sometimes as much a by-product of artistic process. This is to do with an – uncertainty? – a curiosity perhaps, as to whether or not artistic approach is intrinsically different from other kinds of approach. What is it about artistic thinking that can lend itself to not just creating a beautiful artwork, but also potentially to creating a marketing campagin or series of intricate flow charts? As art collaborations with scientists, political activists and other ‘cross-disciplinary’ subjects are the vogue at the moment, is there something specifically, tangibly different about the artistic approach to problem solving? At art college, I used to positively fume when asked why an audience ‘should care’ about my work. At the time, it felt completely backwards to start with the audience and work in reverse order. I suspect that’s how commercial arts practice comes about, but the focus on who the audience are, why they are, whether they are passive bystanders or active participants, message carriers, or advocates – those have suddenly become some of my favourite questions – and with that, communication, and collective thinking start to pile in. It’s a bit of a shift, but it’s an exciting one.